The number 6 has a physical focus. Its energy pools down into the lower realm of the figure. Consciousness slides down the tree of duality into the physical dimension and its perception becomes limited. Perception is from the physical senses and cut off from the subtle senses. It’s like scoping the landscape from the valley. There is only so much you can see. When you look at consciousness, there are various levels of unity and various levels of separation. The Garden of Eden is where there is still the awareness of interconnectedness because there is still perception of the fluid and vaporous realities. Within the garden, the tree of Knowledge gave the Knowing of good and evil. Not an intellectual understanding, but a knowing through living and experiencing this duality. As the serpent descends down the Tree of Knowledge it becomes dormant in Mooladhara, reality shifted and become solid. Perception separates from spirit and consciousness moves to the surface and you believe when the body dies that you also die. Your whole reality arranges itself to accommodate this shift. Being bound to matter in this way creates a state separation. In this state there is loneliness and longing, there is lack and need, there is hunger and emptiness. A new perception of self is birthed to respond to this new paradigm. This is the birth of the ego self. When you are connected to the subtle layers of yourself you know that what you seek is within you and nature. In the six of disks, you are now matter-based and in your separateness you believe that everything you need is outside. You become dependent on the charity of others, you become subject to the systems of power; you become a beggar in your own kingdom. Looking outside creates desire which is an expression of the Kundalini force at the frequency of lust. This sacred energy when expressed from the levels of unity is love and when expressed through the screens of duality, is lust. Lust is a powerful force that solidifies and reinforces the ego self and separates us further from the higher realms. Through lust the sexual energy has a downward flow that nourishes the ego and makes man strong in the world of forms. The feminine principle is wild and vibrant. It wants to experience and explore every dark corner of reality. It was not only the serpent that tempted Eve, but also Eve who lured the serpent down into the adventure of matter, down into creation, down into the play of the world. Here in the six of disks, consciousness has scaled itself down the rainbow ladder of frequencies and presents itself as beggars to the moneylender. 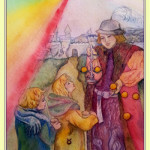 The boy and girl are no longer aware of their connection to nature and the higher realms and are like lost children seeking shelter, guidance and protection. The money lender represents Maya, and is an invitation into the game of the material world. He represents the power of the outer world. He holds the scales which represent the Tree of Knowledge of Good and Evil, the tree of duality. On it is the snake, the symbol of consciousness, twining itself down the central staff. Here the individual has entered the game of life and taken on the veils of Maya, the illusory reality of separation. It is a whole new world of exploration; a new adventure. The ego must be built up so the game can be played. Ahead is the city walls and gate. The boy and girl ready themselves to take on the world. Let the games begin. 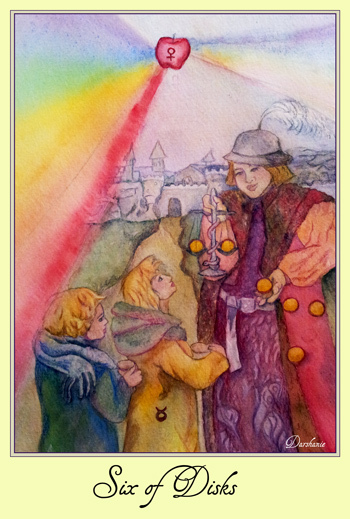 This entry was posted in Disks, Tarot on May 14, 2015 by darshanie.